Do you find free space reducing on you system, one possible for this could be duplicate files ie., same files stored across various locations on your system.This is mostly done as a backup measure storing multiple versions of the same file on the same drive Instead of having a backup on a different drive like External USB Drives is a better option.The difficult task now is to start looking for all the duplicates on the current drive, there are many Duplicate File Finder Programs, but most make the process a lot complex.Anti-Twin is a simple and easy to use Duplicate File Finder which makes the whole process very easy and also lets the path of the deleted files be replaced with links to the original file, so that the next time the file is accessed it opens the file correctly. The interface looks like the image shown below, it primarily has 2 tabs Search and Results.The Search tabs lets configure the search criteria like which folders to look for duplicate files,limiting the search to specific file formats, look for copies of a specific file.The app comes with 2 comparison methods which are Comparing by names and Comparing Content.The search can also be limited to a specific number of duplicates which can be specified in the Search Tab. 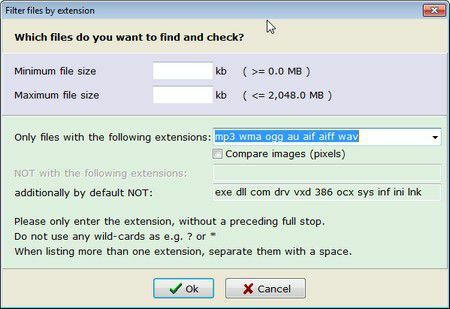 Specific files of a single file format can be identified for duplicates using the File Filter, where the file extension can be specified which would make the search limited to files with that extension. 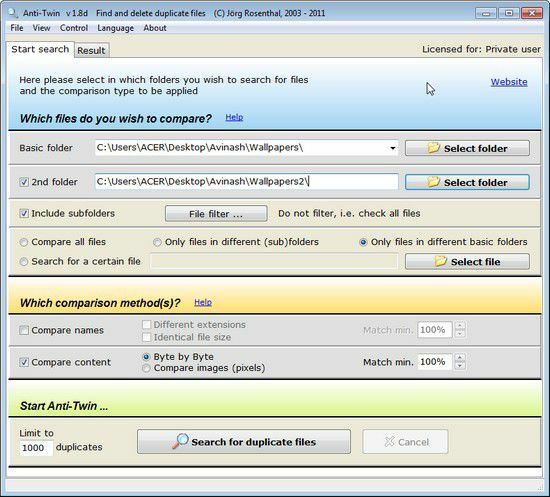 Once the search criteria is set, Click the “ Search for Duplicate Files ” button for the results which is look something similar to the image shown below.Duplicates are grouped together with file sizes shown making it easier to compare the files once again before deleting the files.The results if its images can be previewed by clicking on the file name in the Search Results.For other file formats the files can be opened by double clicking the result. Replace the duplicate files with a link to the remaining file. After this just click Yes, to start the process which should result in getting rid of duplicates files on your machine and recovering space. I use “Duplicate Files Delete” regularly, it is very simple to use.The Duplicate Files Delete help you to find, remove or delete duplicate file. You can try it and solve to your problem.